The PGF2α high sensitivity EIA kit is a colorimetric competitive enzyme immunoassay kit with results overnight + 3 hours. Absorbance is read at 405 nm. 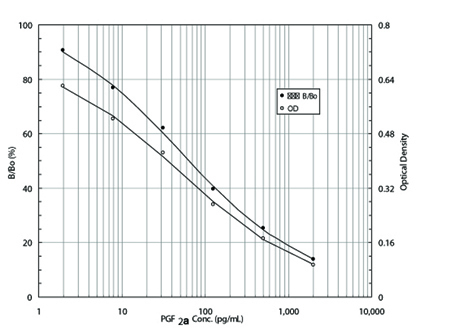 Simply the most sensitive quantification fo PGF2α commercially available in an enzyme immunoassay. Assay more samples without extraction. Application Notes: For the quantitative determination of PGF2α in culture supernatants, milk, plasma, serum, saliva, and urine from any species. Scientific Background: Prostaglandin F2α (PGF2α) is formed in a variety of cells from PGH2, which itself is synthesized from arachidonic acid by the enzyme prostaglandin synthetase. PGF2α is often viewed as an antagonist to PGE2 due to their opposing effects on various tissues. PGF2α is a potent bronchoconstrictor and has been implicated in asthma attacks. PGF2α is also involved in reproductive functions including corpus luteum regulation, uterine contractions, and sperm motility. This has led to its use in terminating pregnancies and inducing labor at term. High levels of PGF2α have also been associated with preeclampsia.